Have you ever noticed how a gray, rainy day makes you feel gloomy and tired, but a sunny day can leave you feeling cheerful and energized? Well, there's a scientific reason for this. Insufficient exposure to sunlight has been associated with low levels of melatonin and serotonin, carbohydrate craving, weight gain, and sleep disturbance. Some of you may have also noticed that you find a seasonal fluctuation in your moods, feeling depressed only in the winter months. Take a look at your calendar and you'll soon see why. Each year on June 21 we experience the summer solstice, the longest day of the year. With our longest hours of sunlight in the middle of summer, it's no wonder we're happier this time of year. After this date, however, the days progressively get shorter until the winter solstice on December 21, the shortest day. Is it any accident then that so many of us run for the hills when the holidays roll around? With our serotonin in such short supply, the added stresses of living up to our images of the picture-perfect holiday are just too much. The medical term for the season-long malaise that we fall into is seasonal affective disorder or SAD. SAD is believed to be caused by a disturbance in the normal circadian rhythm of the body. Light entering through the eyes influences this rhythm. When it is dark, the pineal gland produces a substance called melatonin which is responsible for the drowsiness we feel each day after dusk. Light entering the eyes at dawn shuts off the production of melatonin. During the shorter days of winter, when people may rise before dawn or not leave their offices until after sunset, these normal rhythms may become disrupted, producing the symptoms of SAD. There is also evidence linking SAD to a reduced amount of the neurotransmitter serotonin. Serotonin is the feel-good substance that is increased by antidepressants called selective serotonin reuptake inhibitors (SSRIs). This decrease in serotonin production may be responsible for many of the symptoms of SAD, such as depression and carbohydrate cravings. There is no laboratory test for SAD. It is diagnosed based upon a person's symptom history using criteria set forth by the Diagnostic and Statistical Manual of Mental Disorders (DSM-IV). The DSM-IV does not consider SAD to be a separate disorder. Instead, it is a “specifier” of Major Depressive Episode. In order to be diagnosed with SAD a person must, first of all, meet the criteria for a Major Depressive Episode. At least five of the symptoms listed below should have been present most of the time during the preceding two weeks. Further, at least one of the person's symptoms should be one of the first two items listed. A depressed mood that is due to a medical condition or that is related to the content of a delusion or hallucination that the person is experiencing would not count. Changes in appetite or weight not associated with intentional dietary changes for the purpose of gaining or losing weight. Any symptoms which could be better explained by their connection to a medical condition, drug or alcohol abuse or grief would also not count. In addition, a psychotic disorder, such as schizoaffective disorder, would have to be ruled out as a cause for the symptoms. Light therapy using a device that gives off bright, white light is considered the best form of treatment for SAD at this time. The starting "dose" for light therapy using a fluorescent light box is 10,000 lux for 30 minutes per day. Alternatively, light boxes emitting 2,500 lux require two hours of exposure per day. Light therapy should be started in the early morning, upon awakening, to maximize treatment response. Response to light therapy often occurs within one week, but some patients may require up to four weeks to show a response. Common side effects of light therapy include a headache, eyestrain, nausea, and agitation, but these effects are generally mild and transient or disappear with reducing the dose of light. According to Dr. Michael Terman, head of the Winter Depression Program at Columbia-Presbyterian University, the consensus in the U.S. is that post-awakening bright light therapy, using a broad-spectrum white light source at 10,000 lux, is the first-line intervention. Drugs should be brought in as adjuvants only if the light therapy is insufficient. Optimum dosing of light is crucial since if done wrong it can produce no improvement, partial improvement or even worsening of symptoms. On June 12, 2006, Wellbutrin XL (bupropion hydrochloride) became the first drug approved specifically for SAD in the U.S. 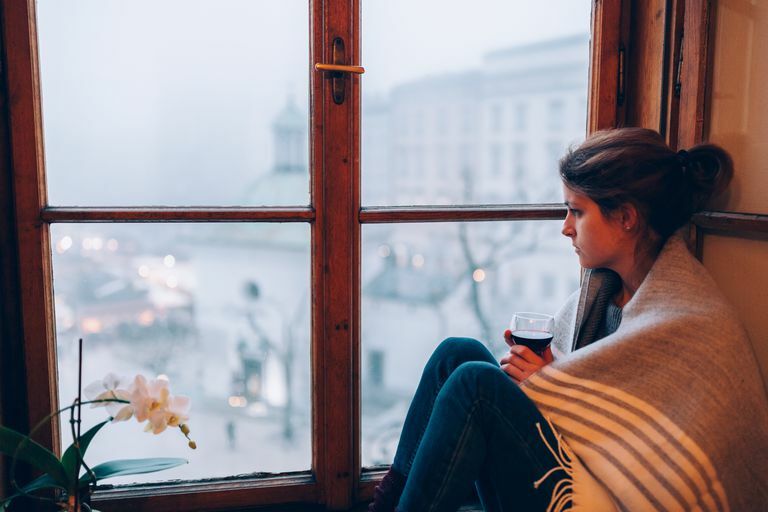 The effectiveness of Wellbutrin XL for the prevention of SAD episodes was established in three double-blind, placebo-controlled trials in adults with a history of major depressive disorder in fall and winter. Treatment began in the September through November timeframe, prior to the onset of symptoms. Treatment ended the first week of spring. In these trials, the percentage of patients who were depression-free at the end of treatment was significantly higher for those on Wellbutrin XL than for those on placebo. For all three studies combined, the overall rate of patients depression-free at the end of treatment was 84 percent for those on Wellbutrin XL, compared to 72 percent for those on placebo. There is no conclusive evidence from randomized trials to support the use of SSRIs in the treatment of SAD. The Center for Environmental Therapeutics (CET), a non-profit organization which provides educational materials about SAD, offers free self-assessment questionnaires that you can download from their site, as well as interpretation guides, to help you determine if you should seek professional advice. Among the quizzes available are the AutoPIDS and AutoMEQ (presented as a pair; AutoPIDS helps you determine you have the symptoms of SAD and what your natural bedtime is, and the AutoSIGH tracks your current state of depression). American Psychiatric Association, Diagnostic and statistical manual of mental disorders. 4th ed. Washington, D.C.: American Psychiatric Association, 1994. “FDA News.” FDA Approves the First Drug for Seasonal Depression. June 12, 2006. U.S. Food and Drug Administration. October 16 2006 <http://www.fda.gov/bbs/topics/NEWS/2006/NEW01388.html>. Feldman, Mitchell D. "Seasonal Affective Disorder." Ferri's Clinical Advisor: Instant Diagnosis and Treatment (2006). MDConsult. <http://www.mdconsult.com/>. Lam, R.W., and A.J. Levitt. "Canadian consensus guidelines for the treatment of seasonal affective disorder: a summary of the report of the Canadian Consensus Group on SAD." Canadian Journal of Diagnosis 15 Suppl. (1998): S1-S15. Postolache, Teodor T. and Dan A. Oren. “Circadian Phase Shifting, Alerting and Antidepressant Effects of Bright Light Treatment.” Clinic in Sports Medicine 24.2 (2005). MD Consult. <http://www.mdconsult.com/>. Terman, Michael. "A Quick Question." E-mail to Author. October 15 2006.